What a bliss it is to see your child becoming more independent! Make that happen with Philips Avent My Grippy Spout Cup. This cup has a unique valve that is leak-free that allows your child to drink freely without the support of no-one, which is highly recommended by moms! It has an anti-slip texture and contoured shape for little hands, which helps toddlers confidently develop self-reliant drinking skills. Advanced valve - leak-proof drinking: When your baby is on-the-go, this leak-proof sippy cup helps ensure mess-free drinking. The unique valve means liquid only flows when your toddler sips, so you don't have to worry about little spills, or toppling cups. Around 91% of moms agree that this cup is leak-proof. Soft bite-resistant spout, for growing teeth: Soft bite-resistant spout, for growing teeth When it comes to comfortable and easy drinking, little ones need a spout that's not only gentle on gums, but that can also stand up to developing teeth. My Grippy spout cup delivers on both, thanks to its bite-resistant spout that's soft. Contoured shape and anti-slip texture: Your toddler will be a confident, independent little drinker in no time, thanks to this cup's easy-grip design. Its contoured shape and anti-slip texture make it easy for little hands to hold. Few parts - easy to assemble and clean: The Philips Avent My Grippy spout cup is made up of only a few parts, making it a breeze to assemble. It comes with a hygiene cap that keeps the spout clean, and all parts are dishwasher safe for your convenience. 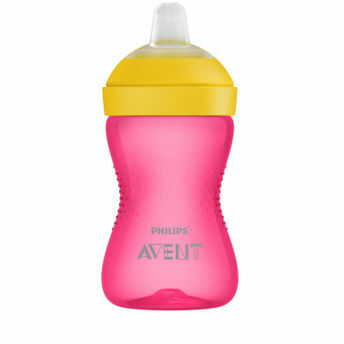 Compatible with Philips Avent bottles and cups: All Philips Avent bottles and cups are compatible excluding the glass bottles and the Grown-up cups/My First Big Kid Cups. So you can mix and match to create the perfect cup, suiting your toddler's individual development needs.